CANMORE, AB, 2018-Apr-20 — /Travel PR News/ — From chipotle mango duck wings and maple-smoked Alberta prime rib, to tempura salmon yellow curry and authentic seafood bouillabaisse, to peach bourbon crème brûlée and unbaked orange Grand Marnier cheesecake, Canmore Uncorked Food & Drink Festival is back with a smorgasbord of must-try local flavours in 2018. Serving up 11 days of remarkable dining experiences this spring, the multiple award-winning Festival returns from Thursday May 3rd to Sunday May 13th, celebrating its 5th year in 2018. 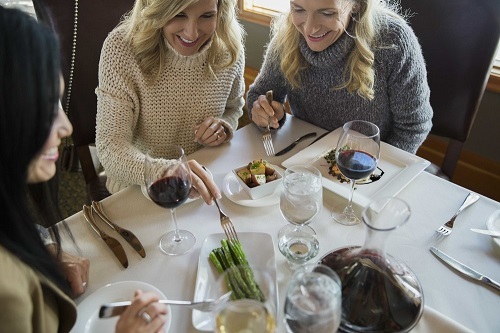 Winner of the Canadian Tourism Award for Event of the Year in 2015, the annual culinary celebration is known for its series of exciting and innovative signature events, which showcase the outstanding talents of Canmore’s local food and beverage industry. Set-Price Menus (Thursday May 3rd to Sunday May 13th). A highlight of the Festival! Value-priced 3-course menus at $25, $37 and $49 at participating restaurants. Set-Price Experiences (Thursday May 3rd to Sunday May 13th). Local businesses will serve up special experiences for $0, 6, or $12, from tours and tastings to tea and chocolate pairings. Cooking Classes (Thursday May 3rd to Sunday May 13th, Paintbox Lodge, $65-$80). Passionate local chefs share secrets at kitchen-party style cooking classes. Themes include One Night Trip to Japan with Sake Pairings, Backcountry Cooks, Spanish Farmhouse, and more. Long Table Dinner (Thursday May 3rd, $179). 8 courses, 8 chefs, 150 guests, and 1 very long table! Join 150 of your new friends for an unforgettable outdoor dining experience amid the majesty of the Rockies. Canmore Wine Festival (Saturday May 5th (Canmore Golf & Curling Club, $55). Enjoy fine wines from around the world, with over 100 to choose from. Find new favourites and learn about how the wines are produced and why each taste is unique. Price includes entry, 20 tasting tickets, plus snacks. The Grande Brunch (Sunday May 6th, The Grande Kitchen & Bar, $39). The perfect Sunday morning! Local restaurants cater brunch under one roof at Grande Rockies Resort’s brand-new restaurant. Try a variety of local brunch specialties, plus locally roasted coffee. Price includes tasting tickets, tea, coffee, juice. Progressive Dinner Tours (Sunday May 6th to Wednesday May 9th, Bike Tour $95, Fine Dining Tour $125). Enjoy fine dining experiences by bus, or cycle & dine tours led by local Olympians! A fun night out to meet some great people, and sample several restaurants at once. Whisky & Spirits Festival (Friday May 11th, Cornerstone Theatre, Canmore, $55). Calling all scotch and spirit lovers! Join us for an evening of great samples and entertainment. Over 60 delicious scotches, whiskies, gins, rums and vodkas will be available to sample. Craft Beer Festival (Saturday May 12th, Canmore Golf & Curling Club, $45). Sample beers from over 20 of North America’s finest craft breweries! Enjoy a wide range of craft beers and ciders, chat with passionate brewers, and make lots of new friends in a fun, relaxing environment. Price includes entry, 20 tasting tickets, plus snacks. Bistro Tours (Thursday May 10th to Sunday May 13th, $179). Juno-nominated Quartetto Gelato lead a musical tour of Canmore featuring fantastic dining, music and venues. Performers walk and eat with guests as you visit 4 different venues, enjoying a course and a paired beverage at each. At the end of each course, the band plays a 20-minute music set, influenced by the food and ambiance at each venue. Andrew Nickerson, Founder & Director of Uncorked Experiences, says whether you sip, sample and savour multiple experiences, or enjoy just one day of the Festival, you’ll discover a truly unique taste of Canmore at this year’s event. “With the sheer amount of quality of dining we have in town, it’s a chance for locals to try some fantastic restaurants they may not have tried before, discover some new favourites, and experience a whole lot of variety at once. We are fortunate that some of the best chefs and artisans in the country have chosen to live and work here, and it’s the fusion of their passion and creativity that drives this whole experience,” Nickerson says. Among the highlights of the Festival, Nickerson says guests consistently rave about the set-priced menus, Long Table Dinner and Progressive Dinner Tours, as well as the unique Bistro Tours. “The music and the overall experience have caused many a tear to be shed, but only in the most positive way,” says Nickerson, describing the Bistro Tours. The Iron Goat Pub & Grill, The Grande Kitchen & Bar, Gaucho Brazilian Barbecue, The Market Bistro at Three Sisters, Crazyweed Kitchen, Wild Orchid Bistro & Sushi Lounge, The Georgetown Inn, Sage Bistro & Wine Lounge, Murrieta’s Bar & Grill, Graze Food & Drink, Silvertip Resort, SandTraps, Rave Coffee, Valbella Gourmet Foods, Canmore Tea Company, Canmore Pasta Company, Canmore Brewing Company, Mountain Mercato, Paintbox Lodge, Evoolution, UnWined Fine Wines Spirits & Ales, Hy Five, and Communitea Café. This entry was posted in Entertainment, Festivals and Events, Food & Drinks, Tourism, Travel, Travel Marketing, Travel Services, Travelers and tagged Andrew Nickerson, Canmore Uncorked Food & Drink Festival, Travel Alberta. Bookmark the permalink.